The Feel ZX3, while rated as an OFF+ blade, still has excellent control on looping even with its fast speed. 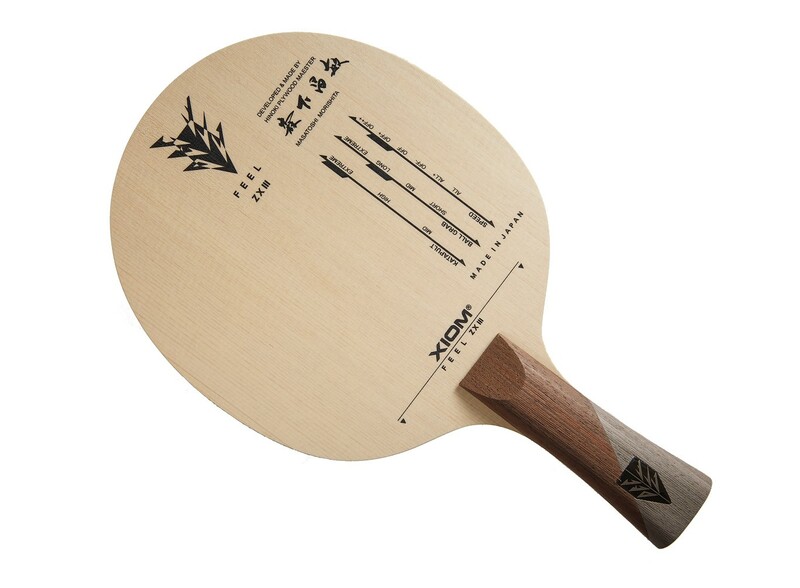 While this blade is on the stiffer side, it has a certain softness and wood feel to it that allow enough dwell time to really charge your offensive strokes. This is a great blade: fast, longer dwell time, very spinny with a good feel (despite being stiff). Mine is 90g, slightly head heavy. I glued with Omega VII Pro FH and OmVII Euro BH, both 2.0. Not struggle to place the ball where you want. The over the table and mid-range game was great, fantastic amount of control for an OFF+ blade. 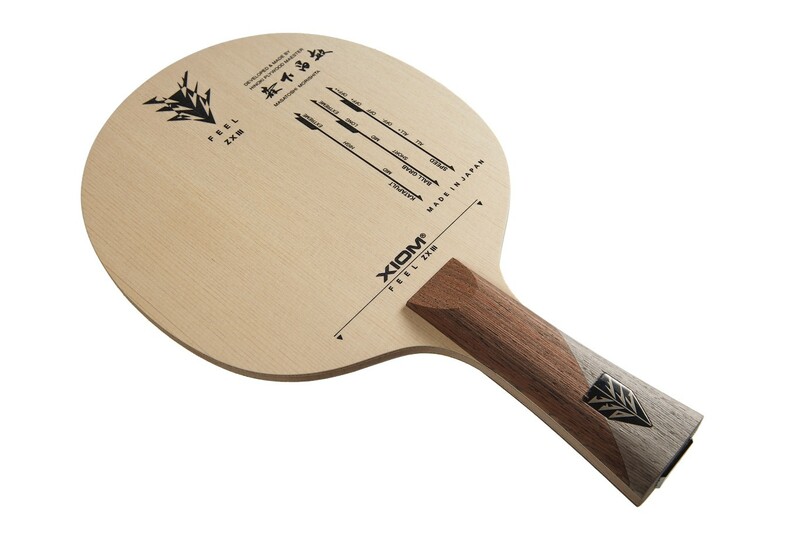 The feedback is very positive with little vibrations that let you know how you´re hitting the ball (maybe due the cylon fibers under kiso hinoki wood). However, I must say that the real problem with this blade was the handle: the wings were to wide, the handle to short, very uncomfortable for rallies or quick fh/bh changes, a total disappointment. After thinking about it, I decided to start sanding the full handle (especially the wings) little by little. After about 30 minutes, I was very happy with the result: a soft handle with better grip, longer than the original and 100% more comfortable. 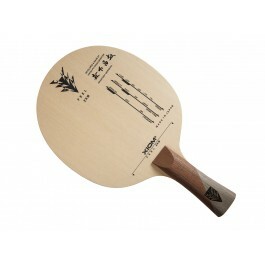 In short, really a fantastic blade, very versatile wiht good control and speed. Maybe you'll need some sanding, but it will be worth it! А powerful blade. Enlarged head increases the overall weight of the bat and creates a significant balance in the head. Counter topspins are very good from long distance. Block-shot is very good. The play by wrist is difficultly. Speed, effect, design, control. Perfect best racket I've ever played, I'm getting used to it, very fast. thanks for the fast delivery TT11. Good job. I've been using this blade for 6-7weeks now, about 12hrs a week. The build quality is at the very top of the scale, absolutely immaculate. The handle is slightly larger than the typical Butterfly or Nittaku, which is to my liking. I have had it set up with Maxxx-P BH and Rhyzm-P FH. Coming off of a TG-506+ I found this combo much faster causing me to hit too far and miss the table. It has taken me to this day to adjust for the greater part of my shots. The feedback from the blade is very positive, vibrating very little but enough to let me know how "well" I've hit the ball. I love this property the blade possesses. It seems to have endless elasticity and power with the Rhyzm-P (crazy fast rubber), which makes it inviting to hit from mid-far and load it up with a power stroke. It is very rewarding on such shots. It, surprisingly, cuts well too, better suited to my aggressive style cuts (Niwa style) with the Maxx-P than just regular style defensive cuts from below the table. Drop shots are easy. Hammering a rising ball off the table, you can finish points with blazing speed. All in all, I have found this to be a terrific blade and I'm very happy with it indeed (thank you Alex for the advice). It is more versatile than any other blade I have played to date, as I am confident in it and can play any style form any position and it just delivers the shot with great feedback. Hats off to TT11 for their unparalleled service and delivery!!! I really like this blade a lot... It Feels crisp... Great feeling. Good power and control... Little to no vibration... The real problem with this blade is the metal emblem on one side is all RUSTED because that side touches my hand when I play. It really bothers me that there's a rusted emblem on one side of it. I wouldn't have bought it if I had known about that... This blade was almost great. Feeling is a little hard and stiff blade. Combine with several rubbers, Tenergy64/ DHS3 & 3-60 / Tibhar Evo-FX / Nittaku G1....Most are good for smash and middle table looping, lack of control for close table. Because this ZLC blade is hard than my ALC blade. May need more practices to get feeling.